India is a country which has historically been the most vegetarian in the world but the recent increase in meat consumption is alarming. Indeed, recent government studies highlight this shift (reporting a clear decline in vegetarianism over the last decade surveyed), and news stories continue to confirm these findings. But what does this all mean? I talked to my Indian colleagues, who have been doing critical work in the food justice space, to find out. It seems that more Indians than ever before are enthused about eating meat, often because they feel doing so reflects a more aspirational or progressive way of life. Eating meat is perceived by some as saying no to what they see as outmoded traditions or religious doctrine, and saying yes to rationality, open-mindedness, innovativeness, progressivism and freedom. However, unbeknownst to most, this new meat-eating ethic is in some ways regressive, often much more so than the attitudes and practices they associate with the traditional vegetarianism that they are rejecting. Plus, in the land that gave birth to the compassionate value of ahimsa, this new ethic is rooted squarely in himsa, and it brings with it the potential for tremendous harm to India. The new trend toward eating meat is in some important ways a step backward, not forward. So, how is this increase in meat-eating fostering the opposite ideals to those that some Indians are claiming to embrace in the name of modern values? There is more to the story than most people — Indians and Westerners alike — realise. Carnism is the invisible belief system, or ideology, that conditions people to eat certain animals. To better understand how entrenched carnism is, think of the cult-classic film The Matrix. In it, the characters believe themselves to be living normal lives when in fact they are hooked up to machines that have imprisoned their minds. Like the matrix, carnism is invisible, so people don’t realise how the system has shaped their attitudes, feelings and behaviours — their whole perception of reality. And carnism is a global system: in meat-eating cultures around the world, people learn to think of a small handful of animals as appropriate to eat, deeming all other animals off limits and often disgusting and even offensive to consume. The only thing that varies across cultures is the type of species considered edible. Most of us go through our entire lives and never wonder why we may, for instance, care about dogs but eat chickens, or care about a dog we’ve named but eat dogs who remain anonymous. It relies on a set of psychological defence mechanisms that distort our thoughts and numb our feelings so that we act against our core values such as ahimsa and justice. And just what are the consequences of carnism? For one, animal agriculture is a leading cause of extensive harm to all animals (including humans) and to the natural environment. 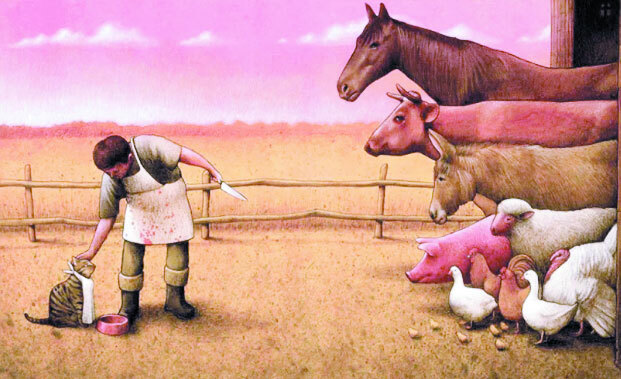 More farmed animals are slaughtered in one week than the total number of people killed in all wars combined. Even contemporary dairy farming, which was originally meant to honour the sacredness of the cow, follows brutal carnistic production methods whereby cows and buffaloes are forcibly impregnated, cruelly beaten and made to die painful deaths. In addition, according to the Food Safety and Standards Authority of India, almost 70 per cent of the dairy that Indians consume is contaminated with additives, ranging from water to salt to detergent. Furthermore, the World Health Organisation has linked meat consumption to some of the most prevalent and deadly diseases in the world today. The United Nations reports that animal agriculture is a key contributor to some of the most serious environmental threats our planet faces. The increase we’re seeing in meat and dairy consumption in India forebodes a potentially massive increase in animal suffering, public health problems and pollution. Carnism discourages our awareness of the problems it causes in part by teaching us to believe in a set of myths that I call the three Ns of justification: eating meat is normal, natural and necessary. And the three Ns have been used to justify all oppressive systems, including patriarchy and casteism. Moreover, these myths are institutionalised, embraced and maintained by all major institutions, from the family to the state. So when we study nutrition, for example, we actually study carnistic nutrition. Because carnism and its myths are invisible, we don’t realise how our thoughts, feelings and behaviours have been guided by this ideology. Most people believe that eating meat reflects exercising their freedom of choice but in many ways it really reflects carnistic conditioning, which is essentially another form of indoctrination. But there is a way forward. Veganism, which is a new kind of vegetarianism, is just beginning to take root in India. It is a rejection of carnism that is being exported by the West to developing countries. This new vegetarianism is at once future-oriented, critically informed, rational and compassionate. Indeed, it is based on ahimsa, a value that is deeply rooted in India than anywhere else on earth. You may be wondering how you can help. I recommend, for those in positions of privilege, people who are economically or geographically able to choose what foods they consume, to try to be as vegan as possible. This means reducing, and ideally eliminating, your consumption of carnistic products. And it’s also important to include veganism in the critical conversations about social justice and environmental sustainability that are increasingly gaining attention. Since vegetarianism was birthed in India, what better place for the vegetarianism of the future to be raised?